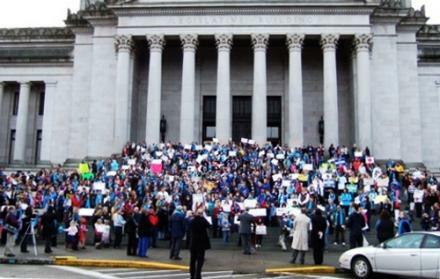 ​Monday, January 16th in Olympia for our biggest advocacy event of the year – Focus Day 2017! Your presence will help us ensure legislators are focused on education and improvements needed for students with disabilities during the 2016 legislative session. Children are welcome and encouraged to attend! The WSPTA membership finalized their 2016-18 Legislative Platform at their Legislative Assembly on October 22nd. Below is the Legislative Platform and a link to more information. Also determined at the WSPTA Legislative Assembly were 3 new WSPTA Resolutions. That information is linked below. Many area organizations and government entities create legislative agendas annually. We want to share some of those that directly impact individuals with disabilities. for Calls to Action from the BSNPTA. We will also send out alerts to our distribution list and members.